Education has recently been shaped by the cognitive science of memory. In turn, the science of memory has been infused by revolutionary ideas found in Wittgenstein’s works. However, the memory science presently applied to education draws mainly on traditional models that are quickly becoming outmoded; Wittgenstein’s insights have yet to be fruitfully applied, though they have helped to develop the science of memory. In this chapter, I examine three Wittgensteinian reforms in memory science as they pertain to education . 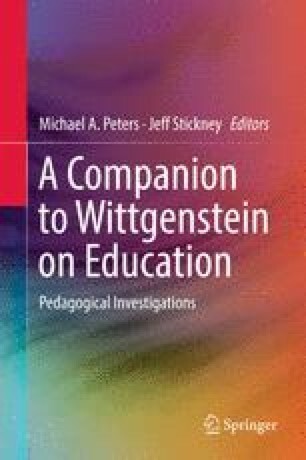 First, Wittgenstein has inspired a particular strain of enactive models of memory and cognition, with important implications for theories of situated learning in education. Second, researchers have begun modeling memory as public practice , which deeply informs, inter alia, fraught theoretical discussions of assessment. Third, a number of memory researchers have rejected models based on a stored trace, a fundamental, Wittgensteinian revision with broad implications for characterizations of learning. An early version of this chapter was presented at the Philosophy of Education Society of Great Britain’s annual conference in at Oxford, April 1–3, 2016. I am also indebted to a series of helpful and fruitful discussions I had, as the paper was developed, with two philosophically inclined education scholars: Aila O’Loughlin and Kailea Saplan.